Arriving at Song Saa Private Island by speed boat makes you feel special. 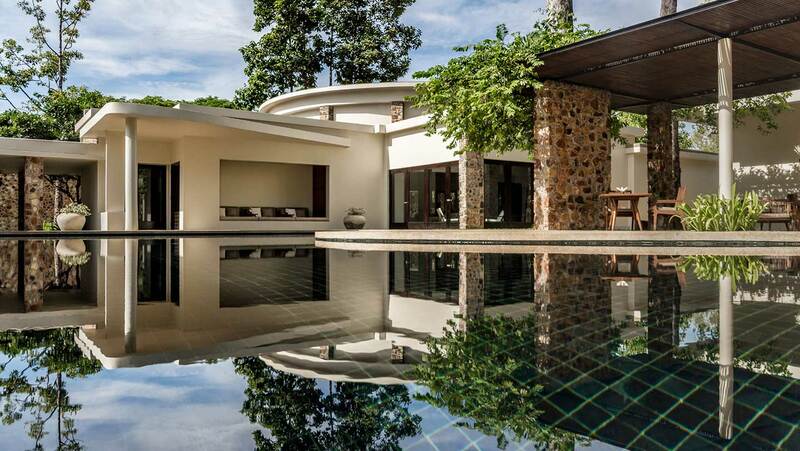 Located 45 minutes from the south coast of Cambodia, the resort occupies two small islands and is exclusive and laid-back in equal measure. 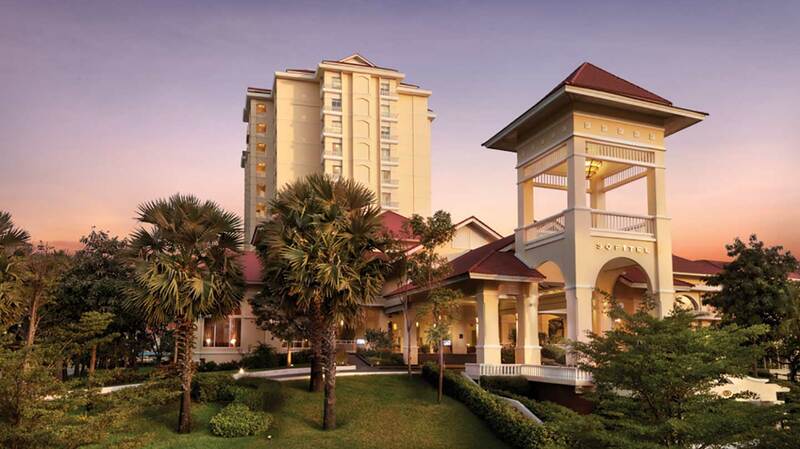 Guests and staff may walk around barefoot but cutting-edge luxury is at your fingertips. Many guests retreat to the privacy of their villas and stay put; others indulge in spa treatments or fitness sessions. You can even embrace your spiritual side and participate in a monk blessing by the sea. Sustainability is at the heart of Song Saa Private Island. All the buildings have been crafted from local materials, including recycled and reclaimed wood. The Song Saa Foundation supports the local community with health and education projects, while the marine programme includes the protection and rehabilitation of coral reefs, as well as the conservation of sea turtles and mangrove forests. 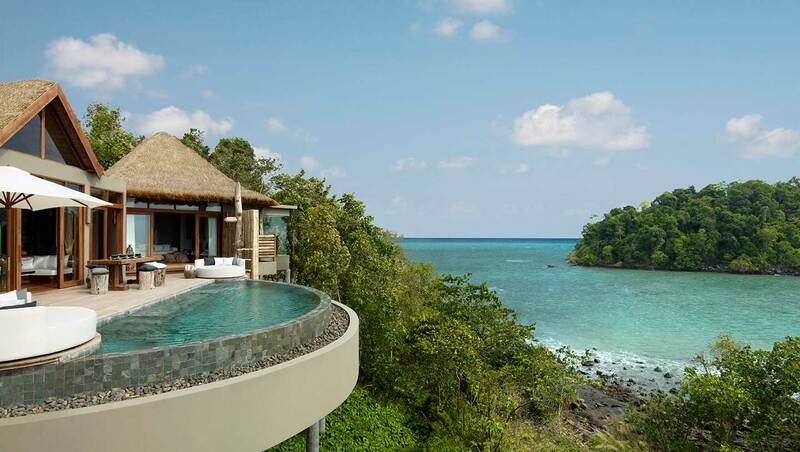 All 24 villas on the island are built from timber with rustic thatched roofs, and have their own private infinity-edged pools. 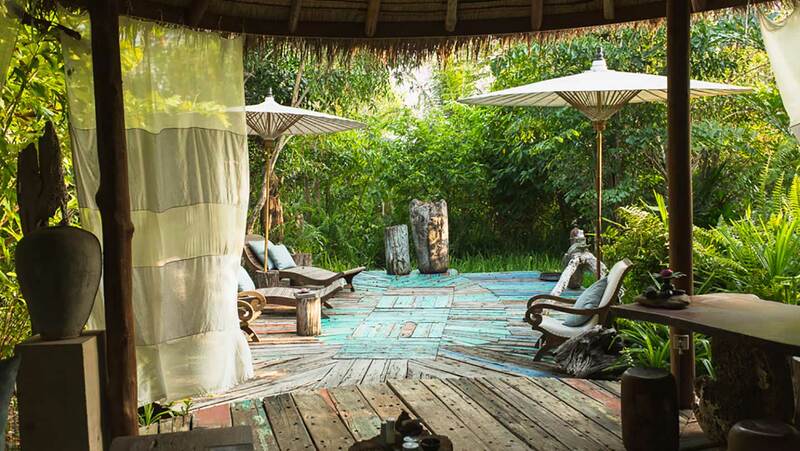 Jungle villas are hidden amongst the trees and offer impressive ocean views. Upgrade to a water villa and you can really be at one with nature. Each villa has stone walls, wooden floors and the most gorgeous bathrooms – we loved the outdoor shower and the large bath tub for two. Linen-draped canopy beds, and repurposed furniture built from driftwood and salvaged wood creates a distinct look. On the deck, by your private pool, you’ll find a day bed to watch the sun set over the main island of Koh Rong. Little shacks dotted across the island house the Song Saa Foundation, a boutique shop and guest services. Here you can organise a trip to the main island or arrange to visit to local villages. There’s the large infinity pool and private beach in between, where water sports such as scuba diving, kayaking and snorkelling can be organised. Time on your hands? Take a stroll across a wooden board walkway and enter the larger jungle island of Koh Bong. Left largely wild, a small path takes you on a nature walk to see a variety of bird including the hornbill and kingfisher, as well as a family of flying foxes. 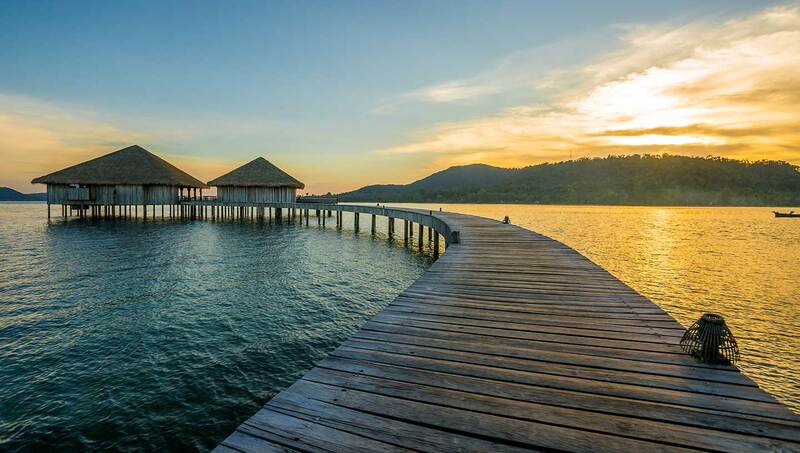 The spa at Song Saaa is a simple affair, with an open-sided reception hut crafted out of bamboo and thatch; treatments take place in separate wooden villas. We tried the Khmer Reflexology treatment (60 minutes, £50), a combination of pressure-point massage and flowing strokes on the feet. The arch of the foot gets most of the attention as this is the area that feels your footsteps; focus then shifts to the toes and back of the heel. My therapist then applied a fresh, light massage oil to each calf and treated them in turn to a fantastic massage – welcome relief after an afternoon in the gym. The mesmerising soundtrack of Hindu chants had me on the brink of sleep. 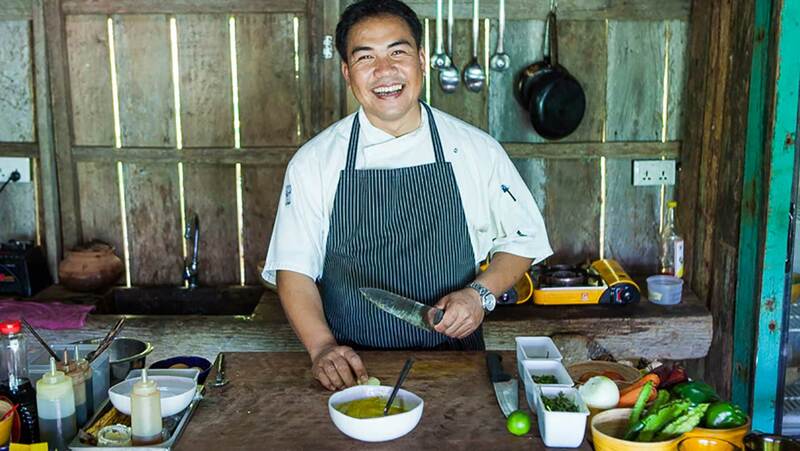 Local fish and Khmer cuisine (think rice, fresh fish, herbs and vegetables) take centre stage at Song Saa. The Vista Bar and Restaurant occupies the best site on the island with its bright and breezy overwater position and uninterrupted views of the ocean. The seafood, all locally caught, is highly recommended, and the tasting menus are excellent. Breakfast is served at Vista. Watch fish swimming as you feast on home-baked breads, tropical fruit, Cambodian noodles or hearty eggs and bacon. For more casual dining or a drink, head to Driftwood Bar. Destination dining is a big deal at Song Saa and a must for anyone visiting. There’s no better way to experience Khmer cuisine than by candle light, with your feet in the soft sand while the waves gently lap against the shore. Honeymooners: Song Saaa is as romantic as any property in The Maldives. Green goddesses: the charitable side of the Foundation, together with, the resort’s green credentials, will appeal to the eco-conscious. 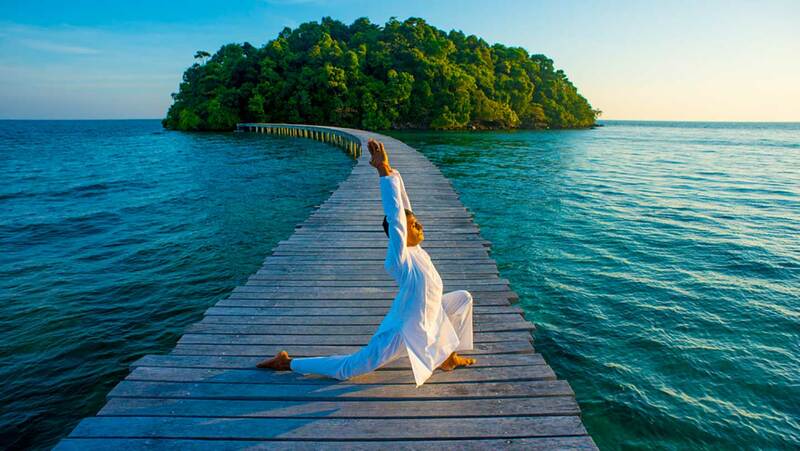 Yoga at sunrise: expertly guided by the spa manager, this is the best way to welcome the new day. The stars: with little light pollution (you are on a remote island), the stars on a clear night are magnificent. "Picturesque views; firm massages; friendly therapists who make you feel at ease; stylish interiors; attention to detail; outdoor hot tubs; infinity pools; fluffy robes and towels; a good selection of spa treatments." "Any attempt to hard sell; inconsiderate therapists; areas in need of a clean; rowdy guests; cheap toiletries; restaurant menus that are overly healthy; cold swimming pools; no private changing areas; paper pants."